International Rhythmic Gymnastics Tournament WINTER CUP 2019 was held in the Polish city of Sosnowiec on February 8. The sports event was organized with the support of the International Federation of Rhythmic Gymnastics. More than 20 clubs from Hungary, Ukraine, the Czech Republic, Slovakia, Slovenia, Portugal, Bulgaria, Israel and Austria attended the tournament. 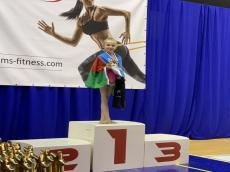 Mina Abbasova, an 8-year-old gymnast, represented Azerbaijan in this tournament. She rose to the highest step of the podium in individual competitions among gymnasts born in 2010 and was awarded a gold medal. Abbasova has been working for the third year in the Budapest “Rus RG Sport” club under the leadership of international category judge Lyubov Bernat and Inga Majkus. The gymnast represented Hungary, where her parents work, in all international competitions since she was 5 years old. However, since August 2018, after the 17th ‘‘Gracia Cup’’ traditional tournament, which was held in Budapest, Abbasova began to perform under the flag of Azerbaijan. During the competition, special training session was hosted by Mlitina Staniouta, a multiple medalist at the World and European Championships. International Rhythmic Gymnastics Tournament WINTER CUP 2019 ended on February 10. Mina Abbasova was born in 2010 in Baku. She currently lives in Budapest with her parents. The girl’s sporting career began when she was 5 years old, and at all international competitions, Mina was able to demonstrate a bright and confident performance. In such a short period of time, the girl gained sufficient experience in performing at prestigious international competitions. Her results are quite impressive. So, in the international tournament Ljubljana-2015 (Slovenia) Mina ranked first, in the ‘‘Grace’’ Cup 2015 (Budapest) she took the second place, in the New Year tournament (Budapest, 2015) - the first place, in the Spring Cup in Budapest - the second place, in ‘‘Grace’’ Cup - 2016 (Budapest) - the first place, in Sosnovichi Cup (Poland, 2017) - the second place, in Pecs Cup (Hungary, 2017) - the first place, in Luxembourg Cup (European Championship, 2017) - the third place, Caorle Cup (Italy, 2018) - the second place, Katowiczi Cup (Poland, 2018) - the second place, in Zagreb Cup (Croatia, international competitions, 2018) - the second place.